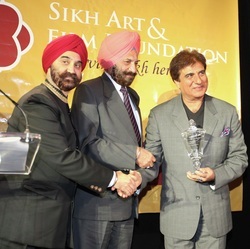 The 7th Annual Sikh Film Festival and Heritage Gala was held at the Asia Society in Manhattan from Oct 21 – Oct 23, 2010. People gathered from all over to celebrate and enrich themselves with Sikh heritage and culture. The Film Festival began on October 22nd with a Red Carpet that featured celebrities such as Raj Babbar and Samrat Chakrabarti. Three films were featured that night which included a premiere of Vikas Khanna’s “Holy Kitchens – A true business”, a premiere of “Harvest of Grief” and “The Rebel Queen” followed by a Q&A with the filmmakers. October 23rd was a completely sold out event that showcased films in competitive categories for awards in Best Short Film and Best Documentary, followed by a Q&A session with the filmmakers. Films throughout the film festival brought up issues such as female feticide, farmer suicides, the Sikh genocide, racism against Sikhs and various other issues that affect Sikhs around the world. After the many moving films, the festival moved to the New York Public Library where a grand gala ended the 7th annual Sikh Film Festival. Chief guest, Preneet Kaur, was unable to attend the event due to a family emergency, however she left a video message in which she complimented the Sikh Art and Film Foundation for their accomplishment in achieving their mission and raising awareness about Sikhism. During the gala Tarlochan Singh, Member of Parliament, awarded Mr. Raj Babbar for his contribution in Vision. Padamshree Vikramjit Sahney was awarded by His Excellency Ambassador Hardeep Singh Puri for his contribution in Leadership. Arpana Caur was awarded for her contribution in Art by the Consulate General of India, Ambassador Prabhu Dayal. The Best Documentary award went to “Khanabadosh” while “Nothing Is Impossible” won the Best Short Film. The Live auction saw immense excitement and participation from the guests. Mr. Ajay Banga, CEO of MasterCard, won the bid to Arpana Caur’s “Sachcha Sauda” at $16,000 and paid for it with his MasterCard. A cricket bat signed by the Indian cricket team was auctioned for $11,500, half the proceeds of which went to the charity ‘Khushi’. Well known singer Sukhbir got the audience dancing to the beat of his popular Bhangra songs, he also performed at the after party which concluded the annual Sikh Film Festival. The 7th Annual Sikh Film Festival was a grand celebration of Sikh heritage and culture which brought out hundreds of Sikhs and non-Sikhs and provided a forum to raise awareness of issues affecting Sikhs all over the world. We look forward to the 8th annual Sikh Film Festival next year!